Scribbles In the Sand........... My Desert Diary: Happy New Year! We've had such a busy 2 weeks. Christmas was so different here. It stays light past ten o'clock at night this time of year so it was impossible to get the kids to bed. Chloe was still awake at midnight when the city exploded with fireworks and people shouting "Feliz Navidad!". On New Year's Eve we moved to our new apartment. For New Year´s we just did our best to keep the kids awake and they were so excited to see the fireworks from our sun room that overlooks the city and the lake. We also bought a kilo of chocolate for the occasion. 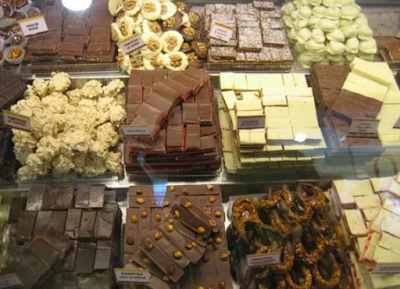 This city has chocolate shops everywhere(even a chocolate factory), and the prices are good for specialty chocolate. It turns out a kilo is a A LOT of chocolate and we still haven´t finished it! Right now we've all come down with colds, but we´re excited to be in our new place. Have a wonderful 2008 everyone! Right, that's 2.2 pounds of chocolate, or .44 pounds per person! Christ, good luck with that!